So I finally got round to making this coin pearl bracelet to go with the necklace that I made a while ago, Maybe in future I should try making them together now there’s a thought! Men, Multi-tasking just doesn’t really work together lol. I love working with coin pearls especially if you can source out real quality ones otherwise it’s not worth it as I guess you could say I try to be a bit of a perfectionist. 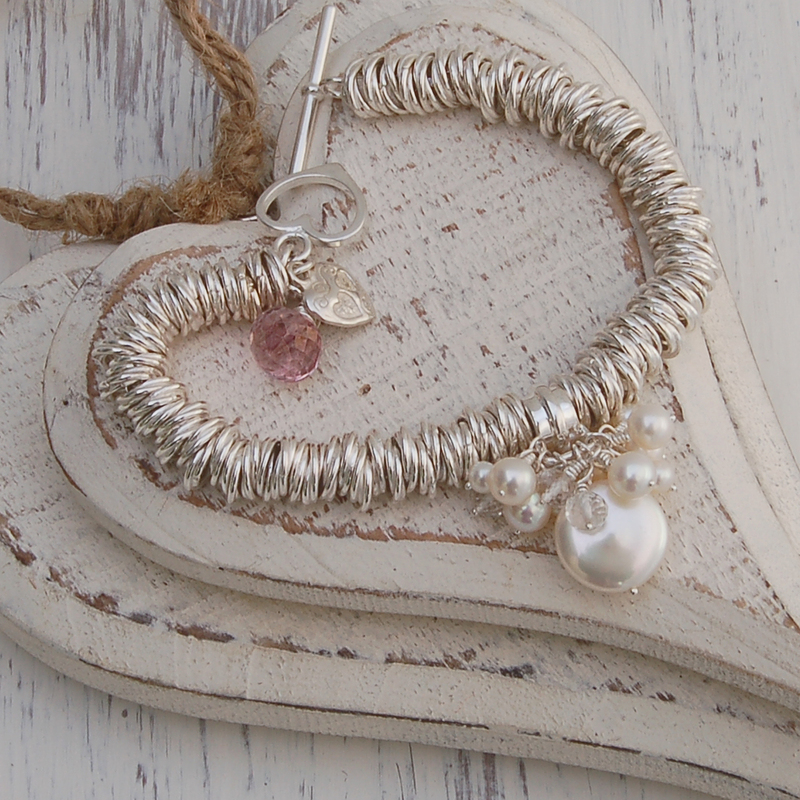 I’d have to admit I’m very fussy when it comes to materials, I have so many designs on paper but I only like to use top quality bits and bobs that’s why I have so many unfinished designs hanging around the workshop. You don’t really see to much coin pearl jewellery about and it’s a bit different from the norm so like I said I love working with them especially when you have a good design you can make some wonderful pieces of jewellery. When I’m in the workshop late at night having a brain storming session! 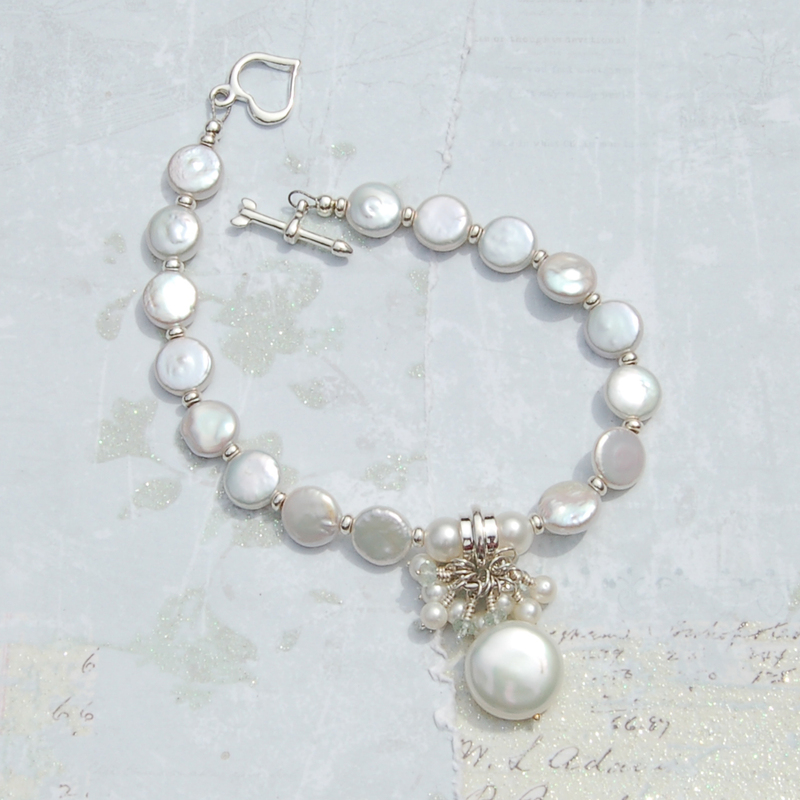 Which let’s be honest doesn’t happen to often lol.I love mixing pearls and gemstones it’s one of my favourite parts of designing but you have to get the mix right for it to have that elegant and sellable look. 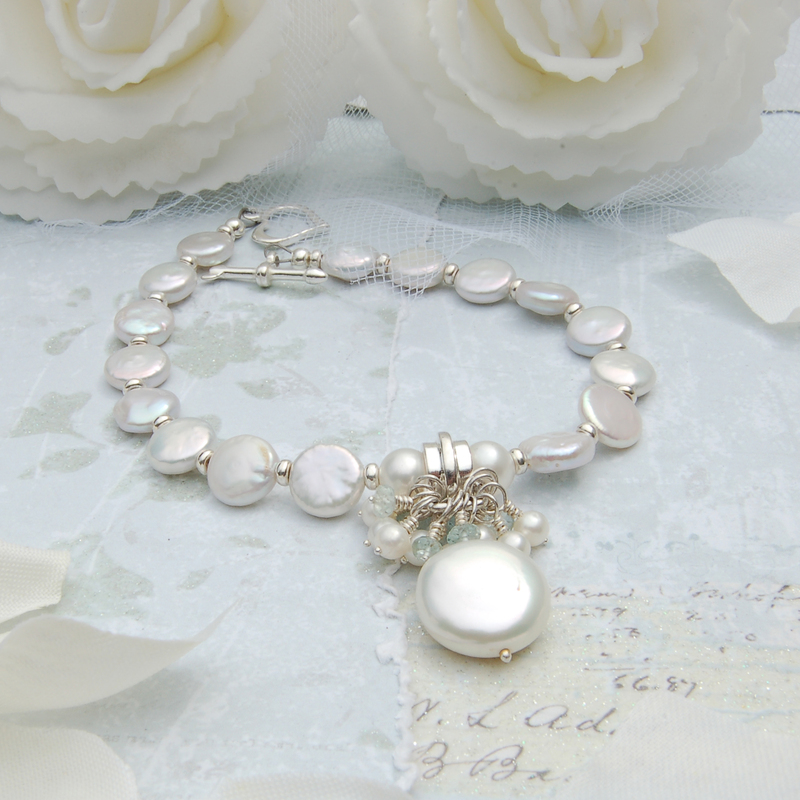 One of the best combo’s with pearls and gemstones I feel is white/cream pearls with blue gemstones, Just something about pearls and blues it makes me think of sandy beaches while watching an Ocean or Sea or I’m I just thinking of where I would lie to be right now! 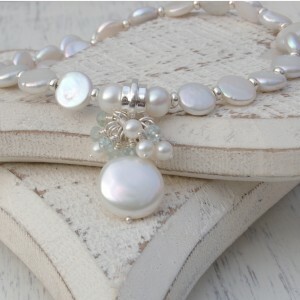 Focus, I have used Aquamarine for this design as you might have read in the title of this blog! But lots of other blue stones would look good as well such as London blue Topaz, Tanzanite or even Sapphire but I went with a warm colour that blends in well and not to over powering but just to give it a little contrast. 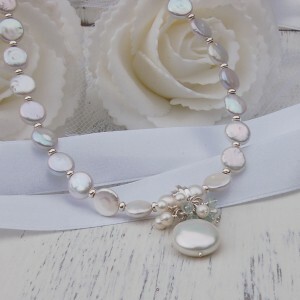 So to start with I have used a solid and elegant sterling silver charm holder with a whopping 14mm graded coin pearl which has a lovely iridescence about it. 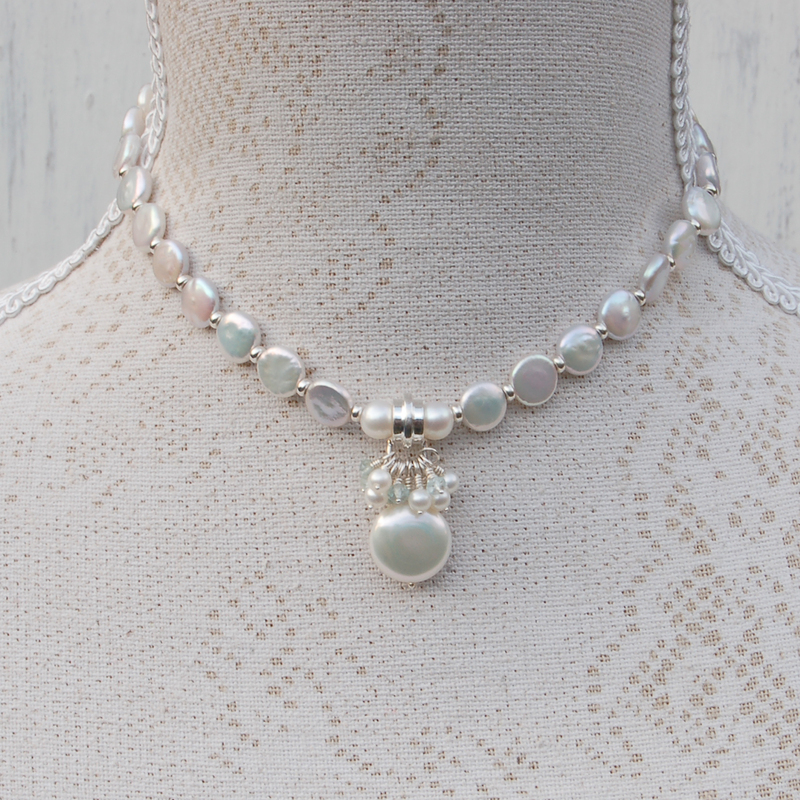 Mingled in and around the coin we have AA graded 3mm Aquamarine faceted rondelles which give it that little bit of sparkly needed which are accompanied with beautiful 3-4mm round pearls so overall it makes a wonderful center piece. 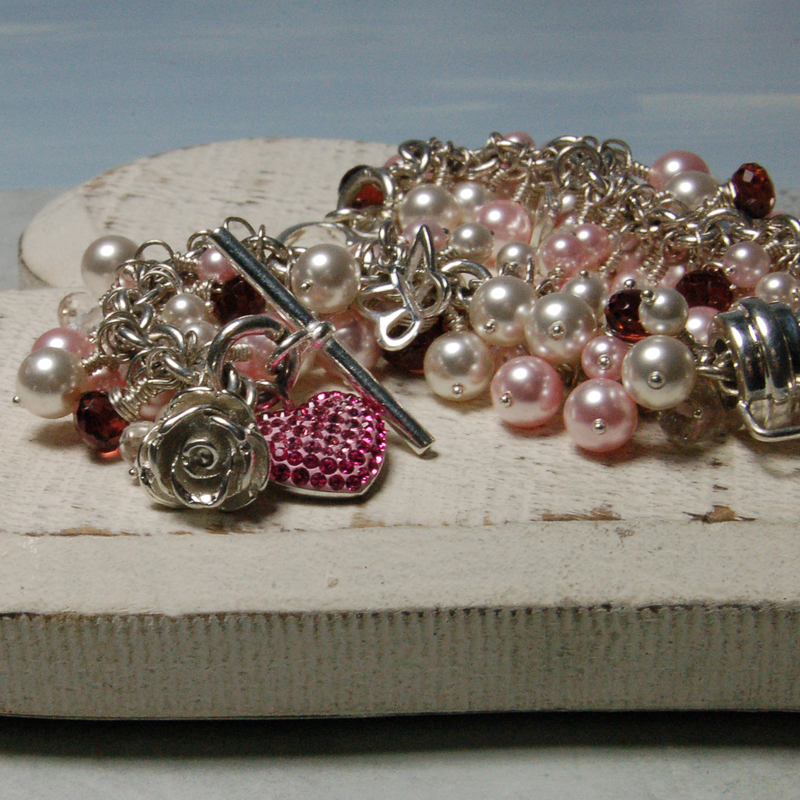 Now for the rest of the bracelet we used 8-9mm coin pearls to tie in the bracelet as a whole, These little beauties have a wonderful shape and colour about them. Now I have changed the clasp used on the necklace to one which I think suits the design a little better, As you can see it’s a beautifully designed twisted heart and arrow clasp and yes it will also be on the necklace from now on( Yes I’m a professional lol). 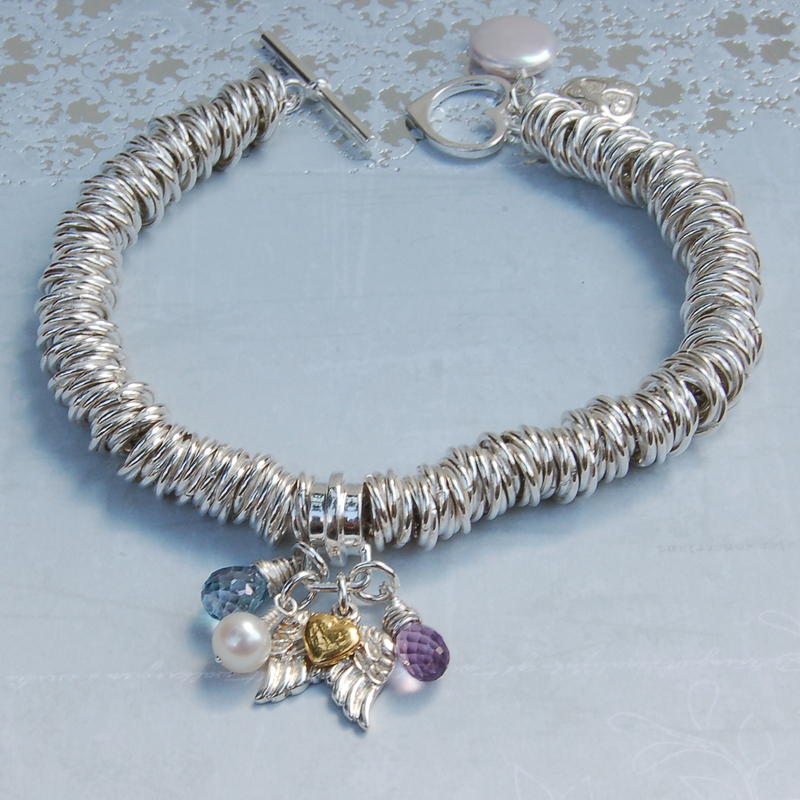 I have to say the bracelet is very feminine and elegant and would look good on any women’s wrist, That’s not being big headed I’m just very proud and happy to have made this piece and if you don’t have confidence in your work then your in trouble. So all I have to do is make up some earrings and bing bang boo what a lovely set we shall have for you lovely people to wear. 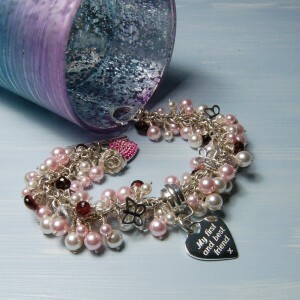 OK it’s Friday afternoon, It’s only taken me a week to write this blog! The day is just starting for me, No rest for the wicked I have to re-take some photo’s of our new personalised silver and rose gold bracelet which I hope to chat about in a few days. Till the next time, Don’t be like the rest, Be an IndiviJewel! Morning one and all, What a gorgeous sunny day we are having this fine Sunday, It’s amazing how a bit of sun puts a spring in your step and a smile on your face! So before I have to drag the kids off Batman 3 to take them and the mad mutt out I want to get this blog up and running, Told you I was getting on a roll with making stuff. Well I’m excited about this design, Some pieces you just get a good buzz about and that’s how it was when making this Coin pearl necklace With the summer season fast approaching it’s even more of a reason to show your pearls off, The way the sunshine reflects off pearls to show the different colors in the pearl are amazing. OK enough about sunshine as I’m getting a bit delirious thinking about a beach and a cocktail, I feel like booking a holiday now, Focus man there is work to do! In any case I need you guys to buy this necklace first so I can go on my travels lol. So first up it’s really hard to find an elegant charm holder bead, There’s not that many around but I have managed to source one out which I’m more than happy with. So on the charm holder I have attached a whopper of a coin pearl, A 14mm one which as you can see from the photo’s looks great quality to which it is! otherwise I wouldn’t use it! 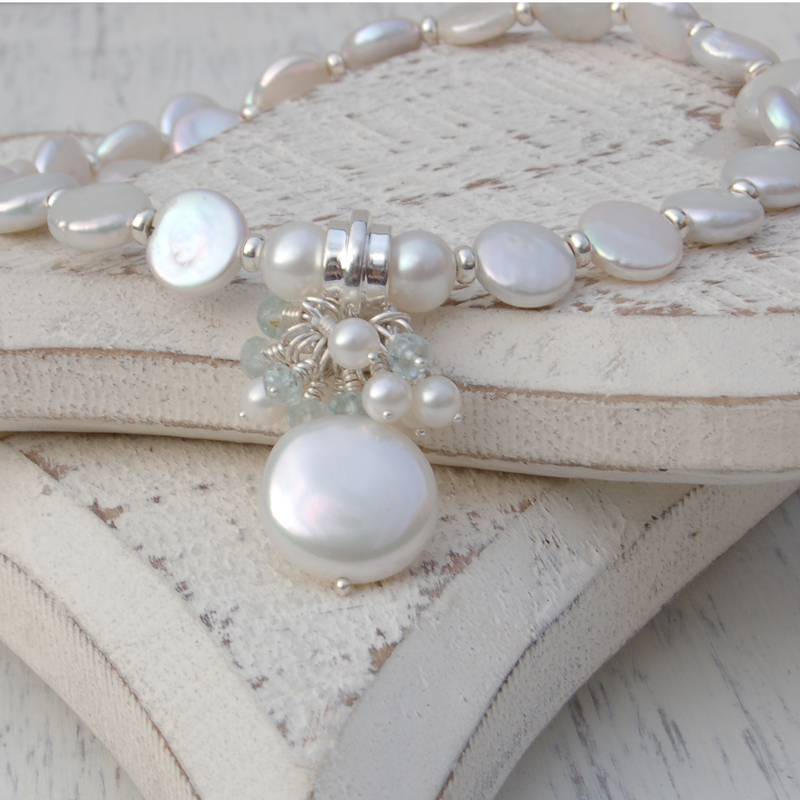 Around the pearl I have added a little cluster of 3-4mm round pearls and mingled in between are some beautiful 3mm aquamarine faceted rondelles, I love using faceted gemstones they just look more classy and give off a wonderful sparkle when the light hits them. So now we have our main focal point it’s onto the rest of the necklace, Now I did try using round pearls for this and it did work but I felt it just wasn’t right so I found these lovely cute 8-9mm coin pearls which when I put it all together just clicked straight away, As per usual I added the sterling silver spacers in between the pearls as I just think it looks more classy and elegant. 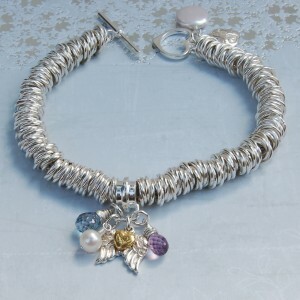 Now the look of the necklace is unique (As always) and it gives the necklace it’s own identity and as you know I like my designs to flow and have the same look all over. So all in all I’m really happy with it and will be making the bracelet at some point today ready for photo’s during this coming week (Fingers crossed). Just as I near the end of another fact based roller coaster of a blog the sky is now GREY! Unbelievable so instead of a nice relaxing stroll in the woods thinking about summer jewellery it will be two head to toe muddy kids and a soggy boggy mutt to clean this afternoon! Right time to say bye for now so see you next time, Be an IndiviJewel! OK so two posts in two days, Whats going on I hear you say! Well I’m at home today as the little one doesn’t go nursery on Wednesdays so while he’s playing Scooby Doo I thought I would grab my chance to jump on the computer and do a little much needed work as ever. Now I very much doubt I will finish this post today but here’s hoping. Now another new product we have recently made is our range of personalised charm necklaces for girls, This has been on our to do list for some time so we are very relieved to have it finished and just in time for Xmas. For those of you that don’t no we now have the tools to make our own shapes now so they can be unique to us to which we think will help us grow the business as we become even more unique to potential customers. So for our first batch of shapes we went for the more well known ones, Heart, Star, Flower, Angel Wing and a butterfly but I do have a few more I would like to make but lets just concentrate on these ones, I do have a tendency to think to far ahead! 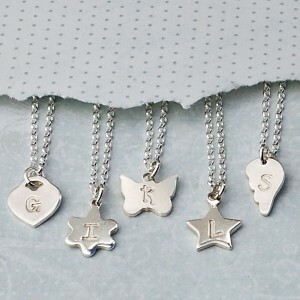 So once we had decided on the shapes of these charms we cut them out and personalised them with an initial, added a sterling silver belcher chain and hey-ho a lovely cute personalised girls necklace which makes a lovely gift for numerous occasions such as Birthdays,Weddings, And christenings. 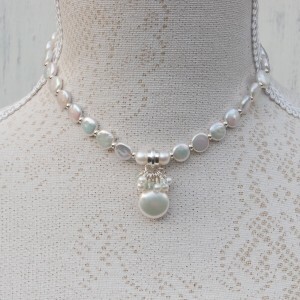 We have also given you the option of adding a beautiful gemstone, Yes that’s right a real graded gemstone not some awful looking bead that you see elsewhere to add to the quality and the overall elegance of the necklace because that’s how we like to roll lol. 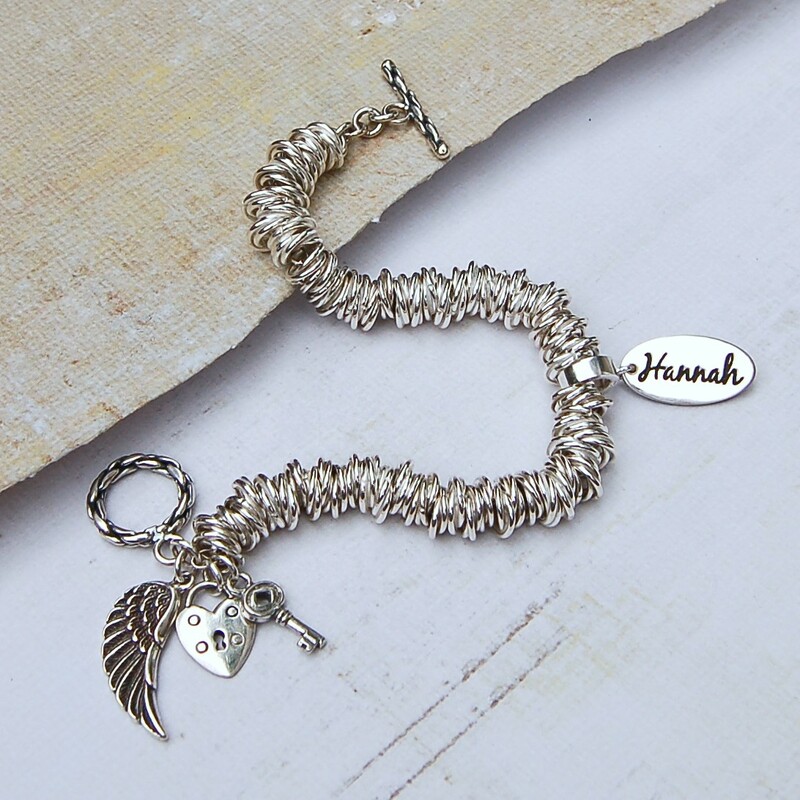 Now as usual it’s not as easy as that a lot of hard work goes on before we send them out such as the hand polishing of these small charms which isn’t easy as some of you will know. 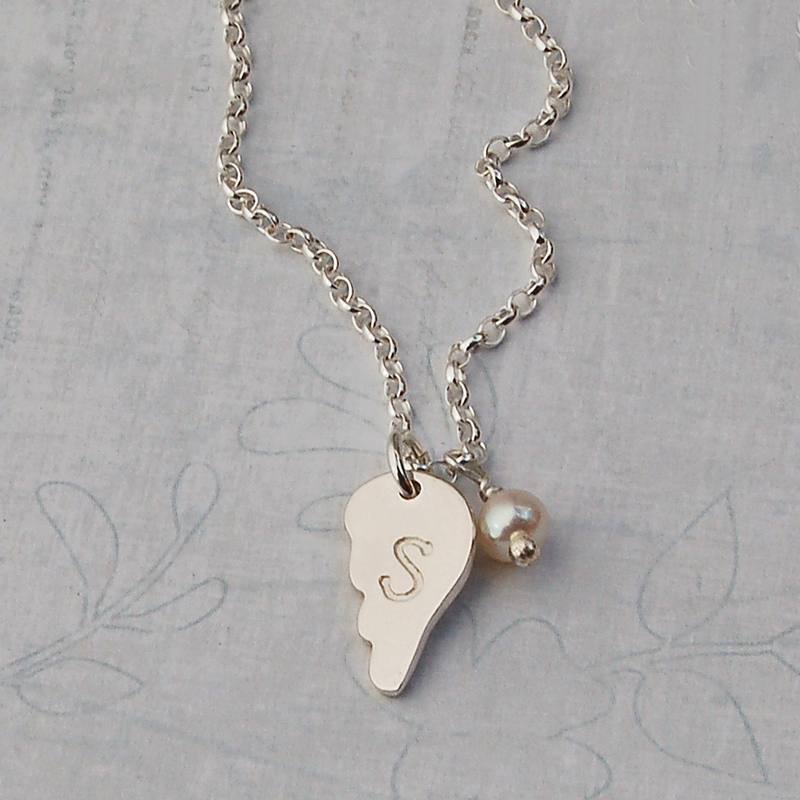 I’m just in the process of making pearl necklaces with these charms, It’s amazing how many ideas you can make out of one design but they will be for another day. OK so it has only taken me a few hours to write these few words! But I’m happy I got it finished today lol so I’m off to play Indiana Jones with the little one, Till the next blog. Well what a wonderful Royal wedding we had the privilege of watching. Thought the occasion was fantastic with the large crowds that gathered up and down the wedding route. I was trying to see what jewellery was on show and I have to say there wasn’t that much and to be honest some of the guests pieces were dreadful, should have shopped with us! lol. 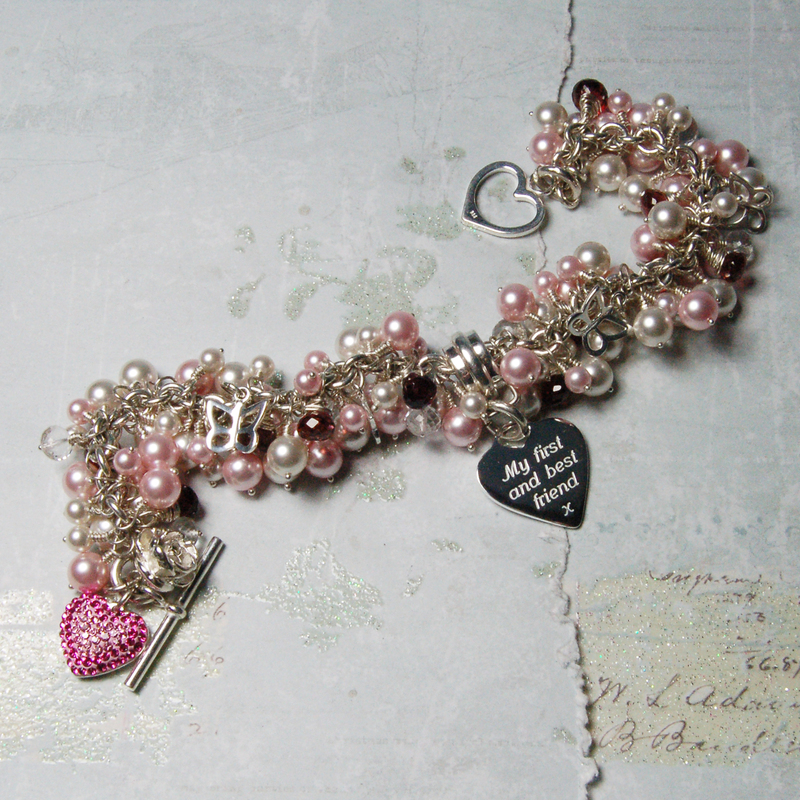 Right now to our new product, might as well join the bandwagon and make a piece to coincide with the wedding. This is a personalised necklace for all those girls who would love to be the next princess. We are currently working on a range for this piece but in the meantime would like to see how this takes with our customers before we commit to other pieces which we are very confident in as with past history. We decided to make a simple piece to begin with which started with a sterling silver disc which measures 16mm in diameter and 1mm thick. 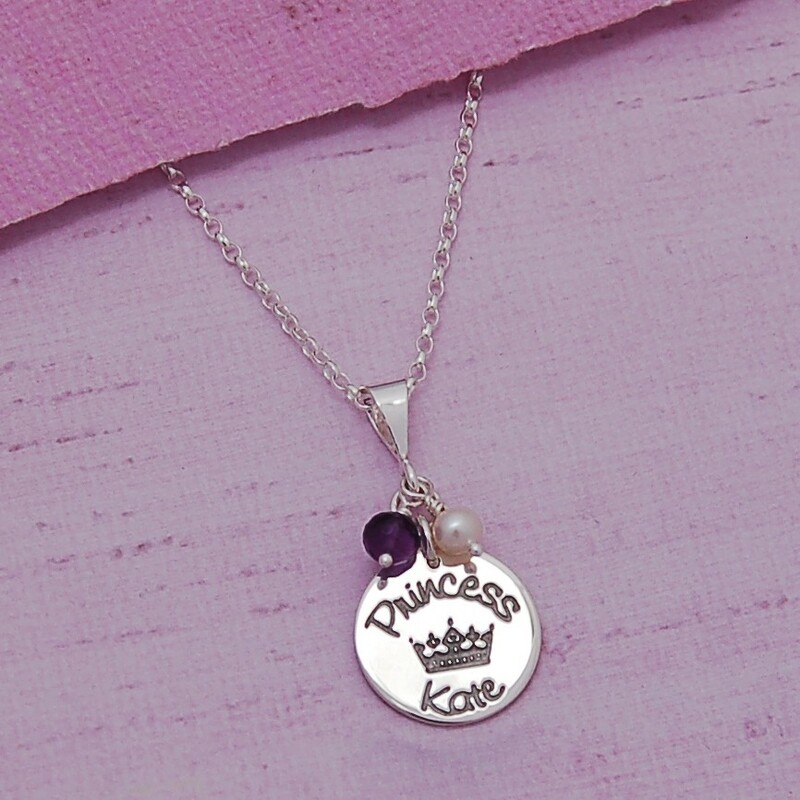 We then etched the word princess and a picture of a crown which will be standard and then the name of your choice in this case we choose Kate for obvious reasons. The disc hangs from a beautiful bail which makes it more elegant and appealing and finally we have given the option of having an Amethyst or Rose Quartz gemstone to sit along side a luscious white pearl. Back again! Two posts in one day, Not bad. 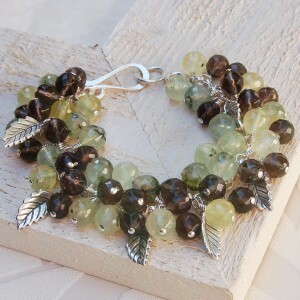 I wasn’t going to blog till next week but had an email earlier tonight about an order for three gemstone and leaf cluster bracelets which arose from our little break in the countryside last week in the North Yorkshire Moors. It was Sues birthday last week so we decided to take off for a quite break and celebration with our two young boys in tow. 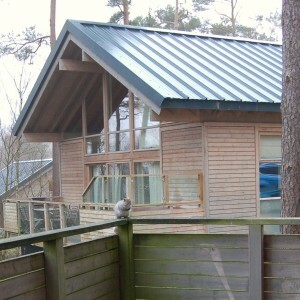 We stayed in a log cabin at Keldy forest near a place called Pickering which took me by surprise because it was beautiful and so was the whole surrounding area, little quaint villages and stunning countryside which I didn’t think existed anymore in good old blighty. Listen to me I sound like a travel guide, anyway as usually you get talking to people in your resort and this we did. Sue took a few pieces with her but it was one piece that got some attention which was the leaf & gemstone cluster bracelet shown below. 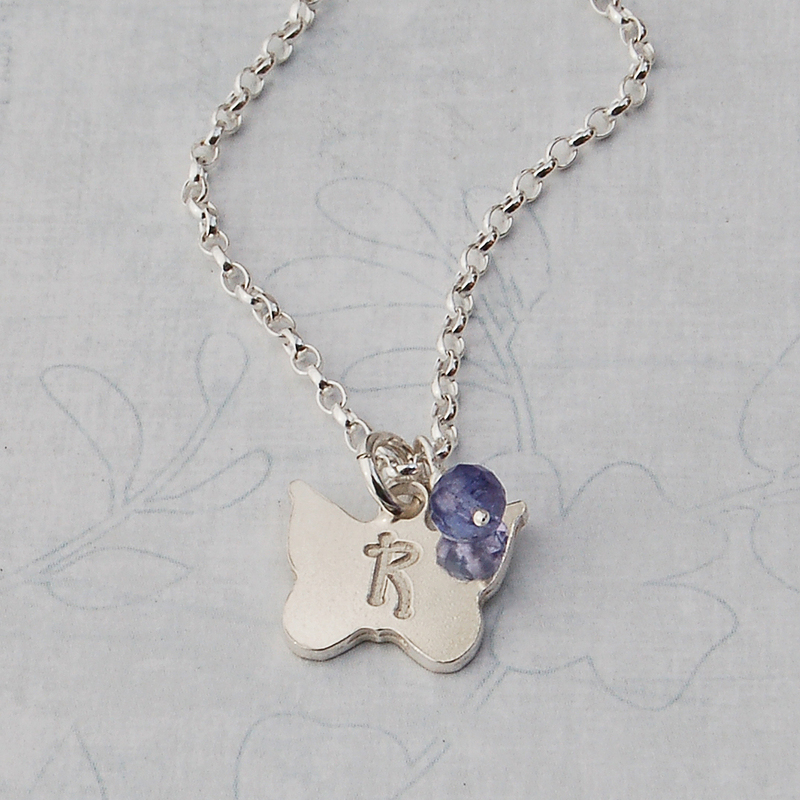 Its amazing how chatty people get when you tell them you make jewellery, So we handed out a few cards and have ended up with a few sales with a few more on the way by the sounds of it. This is the beautiful log cabin we stayed in as you can see we had a rather early party guest.